Featuring four M1014 Network Cameras from AXIS the 0520-044 bundle is a great system for buildings that have an existing Ethernet network. The M1014 supports storage on both microSDHC cards, network locations such as Network-Attached Storage (NAS) or servers. 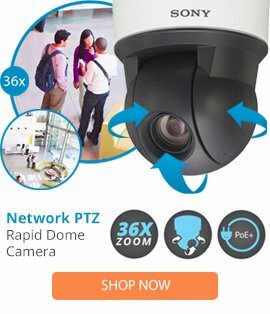 They also support video motion detection, saving a great deal of storage space as the cameras can be set to only record when motion is detected, and an active tampering alarm. Together with AXIS Camera Companion, AXIS M1014 offers a very cost effective solution. It offers superior video quality in its class with HDTV 720p resolution 30fps and provides multiple, individually configurable video streams in H.264 compression as well as Motion JPEG. The H.264 compression enables optimization for bandwidth and storage efficiency allowing more hours of recoding before backup is required. The mounting stand can be installed on walls and ceilings while a mounting clamp allows the camera to be installed in shelves. Each camera comes with its own power supply making it completely self-sufficient.